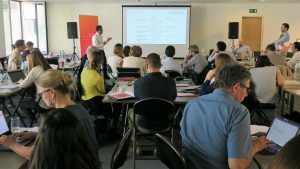 The new strategic plan was presented, debated and approved by ALL DIGITAL General Assembly on 8 May in Brussels. 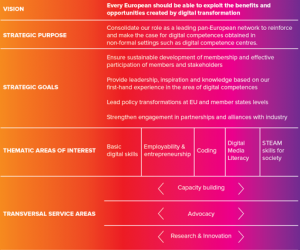 The ALL DIGITAL 2018-2020 Strategic plan has been developed against the backdrop of a society where digital literacy is recognized as a key life competence, as essential, as numeracy and literacy, but in which almost half of Europeans lack basic digital skills. The strategy of ALL DIGITAL is constructed around the strategic priorities, audiences, and services of our member organisations. ALL DIGITAL exists to serve and guide its members, supporting them to grow, develop and improve their services and to increase their impact. OUR VISION: We believe that every European should be able to exploit the benefits and opportunities created by digital transformation. 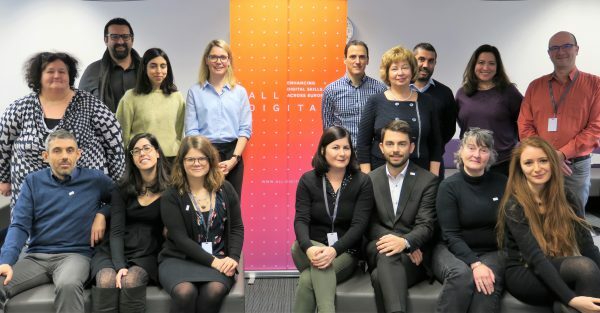 ALL DIGITAL aspires to achieve this vision by equipping European citizens with digital skills, with confidence, and with a mind-set that allows them to understand and benefit from the digital transformation of society. This is what drives us, what defines our priorities and what underlies the distinct role that our network plays in Europe. 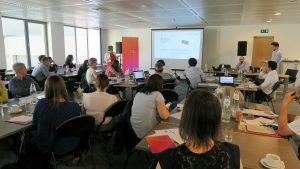 OUR STRATEGIC PURPOSE is to consolidate our role as a leading European network to reinforce and make the case for digital competences obtained in non-formal settings such as digital competence centres. We are excited by the new challenges and will work together with our members to put the plan into action.